Gymnastics and ballet both center on the athlete's body movements -- the strength, balance, flexibility and artistry displayed in a performance. Despite these similarities, gymnastics and ballet are two different physical activities. Gymnastics is a sport that encompasses many disciplines, including women's artistic, men's artistic, rhythmic, trampoline and tumbling, acrobatic, and gymnastics for all, also known as group gymnastics. Artistic is the most popular; it's the discipline where women compete on the floor, vault, uneven bars and balance beam while men compete on the floor, vault, parallel bars, horizontal bar, pommel horse and still rings. Ballet is both a type of dance and a theatrical art. At its simplest level, it's a graceful dance performed on tiptoe with many different feet positions, turns, leaps and lifts. As a theatrical art, ballet is the story set to music performed by the dancers, such as "The Nutcracker" or "Swan Lake." In gymnastics and ballet, the top athletes often began as young children because both disciplines require years of daily training to reach professional status. Ballerinas progress by taking classes and performing in recitals. As ballerinas progress, they begin dancing the pieces to well-known productions. At the professional level, ballerinas join ballet companies and audition for roles in productions. Gymnasts can participate in the sport for recreation, but most gymnasts progress through a series of levels under USA Gymnastics. To pass each level, gymnasts must either demonstrate proficiency of skills or earn a certain score at competition. In the artistic women's program, for example, gymnasts compete from Levels 5 through 10. After Level 10, gymnasts can test for elite status. Elite gymnasts aim to make the national team and compete at the Olympics. While arm positions are important in ballet, the focus is on the legs and toes. All ballerinas begin dancing on their toes in soft shoes. 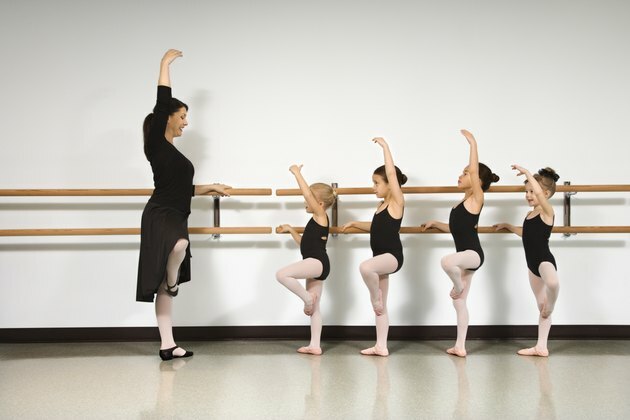 Female ballerinas build up enough leg strength and balance to dance "en pointe," or on their toes. Female ballerinas often lack upper body strength, while male dancers use their upper body strength for lifts. Gymnastics includes some of the similar leaps and turns seen in ballet, but the overall athletics is different because gymnastics is a power sport. Gymnasts run and tumble, flipping their bodies in multiple rotations in the air. Gymnasts have stronger upper bodies because they support themselves on their hands and use their upper body strength to hold positions on the rings, swing around the bars and explode off the vault. Gymnastics and ballet are high-injury activities. Because of intense practices and the pressure to be thin, girls who participate in gymnastics and ballet are at risk for eating disorders, loss of menstruation and osteoporosis. The most common injuries in ballet relate to the pirouettes and turned out positions ballerinas repeat day after day. These injuries include injuries of the feet, ankles, hips and knees. Because gymnastics puts stress on the whole body, common gymnastics injuries include the shoulders, lower back, elbows, knees and ankles. Whereas ballerinas mainly stay on the ground -- dancing on stage or at the barre -- gymnasts perform on elevated apparatuses, increasing the risk of injury.